Talk about first results from divertor heat flux control experiments at Wendelstein 7-X delivered on 2019 Fusion Energy Conference of the IAEA in Mahatma Mandir, India. 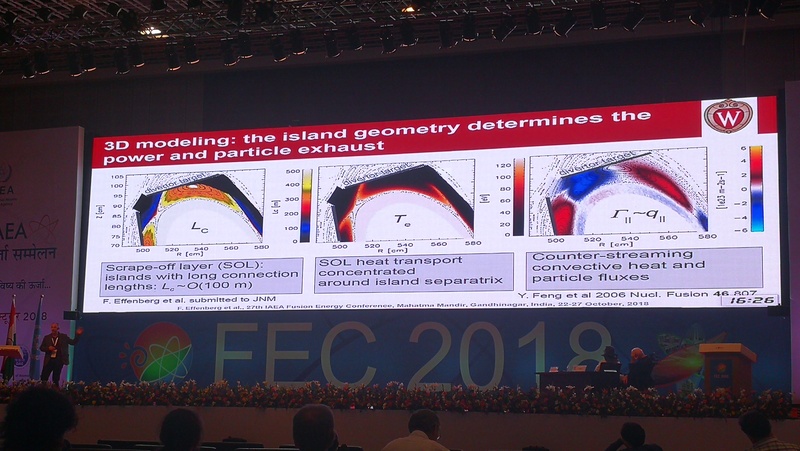 PhD Florian Effenberg, who just graduated in July of this year, has presented the results of his thesis and from very recent experiments developed and coordinated by him at the 2019 venue of the Fusion Energy Conference of the International Atomic Energy Agency (IAEA) in Mahatma Mandir, India. He reported on “Demonstration of Power Exhaust Control by Impurity Seeding in the Island Divertor of Wendestlein 7-X”. The results shown demonstrate for the first time, that local impurity seeding can be utilized in the 3D plasma edge structure of the island divertor domain to accomplish control of the heat flux and fine tune the actual divertor conditions. These investigations, which formed the basis for Florian’s PhD thesis and which recently have been enhanced by new and very dedicated experiments in the compressing island divertor regime at W7-X, are important to extrapolate the heat and particle flux conditions found with the inertially cooled Test Divertor Unit (TDU) to the quasi-stationary, long pulse and high performance discharges in the next operational campaign. This campaign – starting in 2020 – will feature the High Heat Flux (HHF) Island Divertor, which will be actively water cooled and enable operaton of 30 minute long discharges. Heat flux control becomes one of the decissive elements to operate the high performance plasmas at W7-X for such long time sclaes. The team of the 3DPSI group from UW Madison at W7-X constists out of one on-site full time scientist, one post doctoral research fellow, four graduate students and several undegraduate researchers, involved into laboratory projects at UW Madison, which are directly linked to the activities at W7-X. Five people from this group are permanently located at W7-X. This work is funded by the U.S. Department of Energy under grant DE-SC0014210 and by funding of the College of Engineering and the Department of Engineering Physics at the University of Wisconsin-Madison. 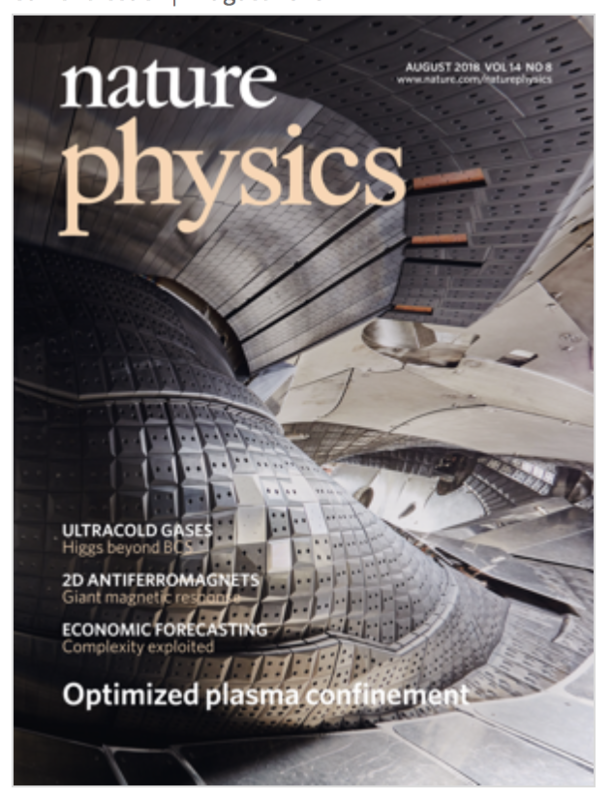 August issue of Nature Physics with title story on Wendelstein 7-X paper co-authored by UW Madison researchers. The title story of the August 2018 issue of Nature Physics is based on a paper co-authored by personnel of the 3D-PSI group at UW Madison. In the paper by A. Dinklage et al. 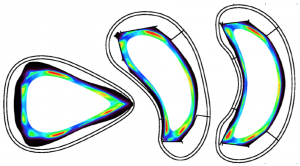 on “Magnetic Confinement Effects on the Wendelstein 7-X stellarator” an overview is presented on scenario and performance accomplishments during the startup campaign of this brand new stellarator device. Highlights are that a scaling of the energy confinement matching H-mode confinement in tokamaks was seen and record electron and ion temperatures were reached. Also, the first campaign provided clear evidence for small bootstrap currents in W7-X plasmas – a design criterion which is of seminal importance for a stable island divertor solution. PhD students and researchers from the 3D-PSI group were involved in gathering the material presented related to the plasma edge and divertor properties. The next campaign is presently commencing with the participation of three graduate students, one postdoctoral researcher, one assistant scientist and Prof. Schmitz. In this campaign, higher device performance is expected as the island divertor is now installed and a controlled plasma-material interface will be established. This work is funded by. the U.S. Department of Energy under grant DE-SC0014210 and by funding of the College of Engineering and the Department of Engineering Physics at the University of Wisconsin-Madison. Outreach activities on Plasma Physics commencing in Summer 2018. Professor Schmitz has conceptualized in the past two years a number of outreach activities and these outreach activities are now commencing for the first time. The declared goal of this program in the K-12 education arena is to bring Plasmas as a widely relevant state of matter to students of the entire basic education program. 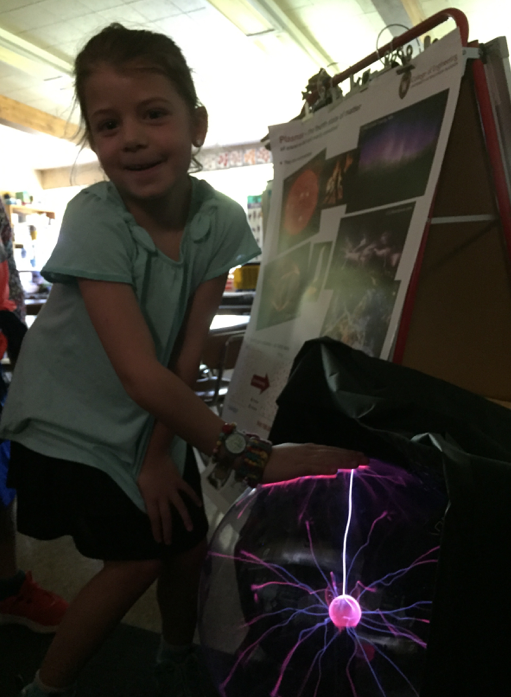 On Monday 06/04, he visited a first and a third-grade class at Glen Stephen’s Elementary, Madison, WI and presented a Plasma Show. This show takes the kids on a journey from basic plasma phenomenon and appearances to the basics of electrostatics and hands-on experiments on a giant Plasma Ball. Students learn about light emission from plasmas and how it is generated to magnetic fields used to contain plasmas. It is a great pleasure to experience the untampered, grand curiosity of children at that age, approaching to comprehend a totally unknown subject matter without any hesitation. In summer 2018, Prof. Schmitz will also teach a two-week Research Experience for high school students guided by two high school teachers and later a one-week “Plasma Academy“, in which a group of six high-school students and six teachers will develop teaching modules for the Advanced Placing Physics curriculum in the state of Wisconsin. It is planned to continue the summer internship in a weekly internship project for high-school students starting this fall. This K-12 outreach activity is funded by the National Science Foundation as part of Prof. Schmitz’s CAREER award under grant number PHYS-1455210. Teachers or students who are interested in either of these activities, please contact Prof. O. Schmitz. 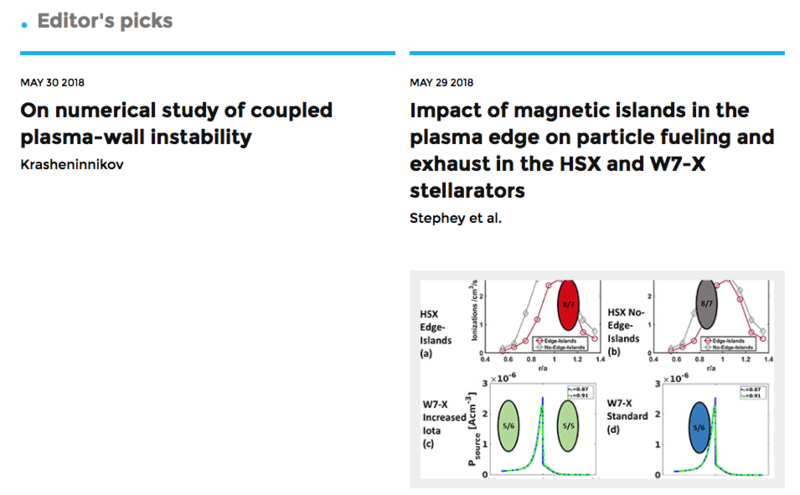 A paper comparing particle exhaust in the island divertors of W7-X and HSX published in Physics of Plasmas and selected as a monthly highlight. A paper published in the AiP journal Physics of Plasmas by Dr. Laurie Stephey, a former PhD student at HSX, was selected as a monthly highlight. In this paper, a comprehensive comparison of particle transport and exhaust features of the island divertor at the HSX experiment at UW Madison and the Wendelstein 7-X (W7-X) stellarator in Greifswald, Germany is presented. It is shown that the magnetic island geometry which is the topological basis for this divertor concept defines the fueling and exhaust ratio for recycled neutral particles sources at the surrounding vessel walls and divertor targets. While HSX does not feature a formal divertor baffling structure it still enabled to reveal the neutral compression capability in the island domain, which would allow defining a physical divertor structure for particle exhaust. At W7-X, at the time of the experiments, no divertor structure was implemented either and the experiments discussed in the paper were an important step to explore the role of the islands for the plasma edge transport. Presently, the first campaign with the island divertor including a full divertor housing and closure is commencing and the study presented in this paper provided substantial insight into the relation between the particle transport caused by the islands. This work is funded by the U.S Department of Energy under grant DE-SC0014210 for collaborative research on large-scale stellarator devices and the HSX grant DE-FG02-93ER54222. A numerical study explores the sensitivity of Small Angle Slot (SAS) divertor at DIII-D on toroidal asymmetries! A paper published as a Letter in the IoP journal Nuclear Fusion this week by Dr. H. Frerichs studies for the first time the sensitivity of the Small Angle Slot (SAS) divertor at DIII-D on toroidal asymmetries. Such asymmetries can be a result of the imperfect alignment of the confining magnetic field with the toroidal opening of the slot divertor or be born from effects of the plasma equilibrium leading to 3-D effects on the plasma boundary. Scientist Dr. H. Frerichs in the 3D-PSI group has studied the resulting impact on the neutral compression and heat flux characteristics in the SAS for DIII-D in detail using the EMC3-EIRENE plasma fluid and kinetic neutral transport code. These simulations show that toroidal asymmetries in divertor closure result in (non-axisymmetric) local onset of detachment within a density window of 10? 15% on top of the nominal threshold separatrix density. The SAS divertor is explored at DIII-D for improving access to cold, dissipative/detached divertor conditions. The narrow width of the slot divertor coupled with a small magnetic eld line-to-target angle facilitates the buildup of neutral density, thereby increasing radiative and neutrals-related (atoms and molecules) losses in the divertor. Small changes in the strike point location can be expected to have a large impact on divertor conditions. 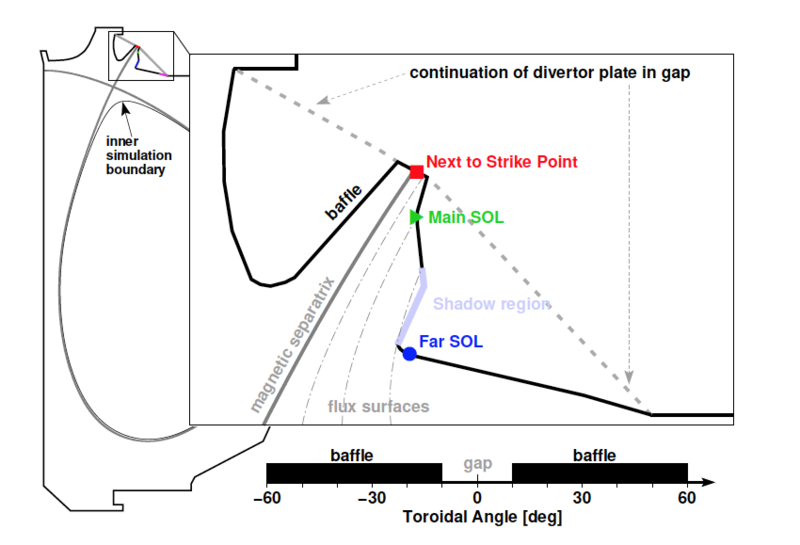 The combination of misaligned slot structure and non-axisymmetric perturbations to the magnetic field configuration causes the strike point to move along the divertor target plate, possibly leaving the divertor slot at some locations. The latter extreme case essentially introduces an opening in the divertor slot from where recycling neutrals can easily escape, and thereby degrade the performance of the slot divertor. PhD student Florian Effenberg was awarded the 2017 James D. Callen Fellowship for Excellence in Plasma Theory. Congratulations! The 2017 James D. Callen Fellowship for Excellence in Plasma Theory was warded to PhD student Florian Effenberg. Florian works on numerical modeling of 3D plasma edge transport and radiative divertor scenarios for the Wendelstein 7-X stellarator in Greifswald, Germany. He has undertaken groundbreaking assessment of 3D scrape-off layer transport studies during the startup-campaign of the device and is presently leading the research thrust on radiative divertor scenarios in the island divertor at W7-X. His work is funded under DoE grant DE-SC0014210. Congratulations, Florian! Two papers on the Plasma Material Interaction in 3-D plasma boundaries were published in Physica Scripta following presentations at the International Conference for Plasma Facing Components (PFMC) 2017 in ness, Germany. Two papers on plasma material interaction were recently published in Physics Scripta. 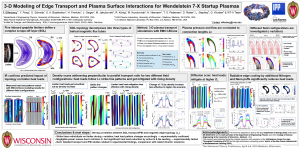 The first article authored by PhD student Victoria Winters on “Overview of the plasma surface interaction analysis in the limiter phase of W7-X” described results on the erosion and deposition on the limiters of the startup campaign at Wendelstein 7-X. The collaborative research with the MAx-Planck Institute in Greifswald, Germany and the Research Center Juelich, Germany has revealed the erosion and deposition zones on the limiters at W7-X. This was a first time analysis combining in-situ spectroscopic measurements taken during the plasma exposure in W7-X and post-mortem surface analysis in such a 3-D magnetic edge topology. This work was funded by the U.S. Department of Energy under grant DE-SC0014210 and DE-SC0013911 . In the second paper, authored by post-doc Edward Hinson stationed at the U.S. national fusion facility DIII-D in San Diego, CA, USA on “Study of the impact of resonant magnetic perturbation fields on gross tungsten erosion using DiMES samples in DIII-D”, the erosion properties of a tungsten (W) test sample in the 3-D boundary induced by resonant magnetic perturbations was investigated for the first time in detail. The paper describes the results of an experiment comparing gross tungsten erosion on samples exposed to OSP sweeps in L-mode with and without RMP. It was found that upon RMP application, lobes evident in divertor camera data and on Langmuir probes increased gross erosion in the RMP cases by no more than 30% above the level observed in unperturbed discharges. A large reduction in gross erosion (50%) was observed in the private flux region at the W sample for one specific toroidal phase of the RMP field. This work was funded by the U.S. Department of Energy under Early Career Award grant DE-SC0013911. Successful participation of the 3D-PSI group on the 2017 conference of the Division of Plasma Physics of APS in Milwaukee. It was almost a home game for us in Milwaukee last week. Seven posters and one contributed oral talk were presented by the members of the 3D-PSI group on this most important national meeting in our field. We showed exciting results from the research at Wendelstein 7-X, a contributed oral talk was delivered on first time results of Helium Exhaust with RMP fields and the breadth of recent results from EMC3-EIRENE modeling of plasma edge transport and neutral; particle physics was shown. Also, a new collisional radiative model for reconstruction of electron density and temperature in Ar plasmas in our helicon device MARIA was presented. Please find authors, titles and the according presentations below. Neutral particles can drive significant plasma flows in the edge of a high temperature plasma. 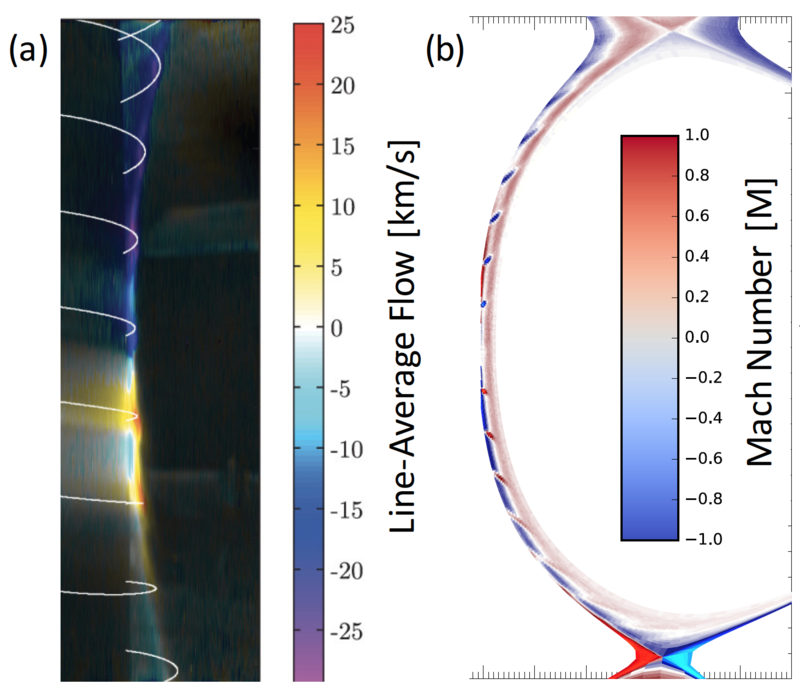 Full 3-D modeling of plasma edge transport and the interaction with the neutral particles around this edge plasma revealed the impact of localized neutral sources on the plasma flow pattern. PhD Student Ian Waters carried out a series of simulations using the EMC3-EIRENE code to investigate unique Scrape-Off-Layer flow structures that were measured at the MAST tokamak. The simulation (b) was in good qualitative agreement with the measured flows (a) as shown in the figure below (lefts side, the measured flow and right side the modeled counter part). Detailed analysis of the EMC3-EIRENE results and development of a 1-D model along the magnetic field lines enabled to identify the key physics driving this phenomenon. The localized neutral fueling builds up a significant static pressure which pushes agains the plasma pressure driving a significant parallel plasma flow along the field line. These first time results provide insight into the fueling and exhaust features at the transition between confined plasma and the exhaust channel, called the scrape-off layer. This radial domain marks a bifurcation point for the radial and parallel particle flux balance and the role of parallel particle flows for into the divertor of the device is a key element of the plasma fueling and exhaust characteristics in a magnetically confined fusion device. This work was presented at the 2017 Sherwood Fusion Theory Conference in Annapolis, MD and the 2017 European Physical Society Conference on Plasma Physics in Belfast, UK. This project is funded by the Department of Energy under grant DE-SC0012315. Wendelstein 7-X is operating again! New diagnostic system developed at UW Madison implemented! The next experimental campaign at the next generation stellarator Wendelstein 7-X in Greifswald, Germany is commencing testing for the first time island divertor concept in combination with highly optimized plasma core performance. One key task of such a divertor is to exhaust neutral particles and impurities and control plasma density as well as impurity density. UW Madison PhD student Thierry Kremeyer has developed a unique neutral gas measurement device which has been implemented into W7-X. This new, miniaturized in-situ Penning probe head enables investigating the neutral gas composition directly in the neutral compression region (baffling) of the island divertor at W7-X. This system is now implemented at three positions in one half-module (i.e. at one toroidal location). A state of the art light detection system from the oak Ridge national laboratory ORNL is used for fast time resolution and simultaneous measurement of H? and three He-I lines. This unique set of spectroscopy is aiming on delivering first time spectroscopic information about the plasma state inside of the gauge, while measuring at the same tome the total neutral pressure reliably. Further refinements of the system are pending depending on the outcome of the first deployment now. A comprehensive experimental proposal has been accepted and is being implemented into the run plan to investigate the helium exhaust features of the island divertor with various magnetic configurations. This project is funded by the Department of Energy under grant DE-SC0014210. Paper by Prof. O. Schmitz on comparative studies on Helium exhaust with RMP fields at TEXTOR (tokamak) and LHD (heliotron/stellarator) was selected as highlight for 2016 in the IoP journal Nuclear Fusion. The paper on “Enhancement of helium exhaust by resonant magnetic perturbation fields at LHD and TEXTOR” was selected as a 2016 highlight in the top-journal Nuclear Fusion. The paper demonstrates for the first time that small amplitude, resonant magnetic perturbation (RMP) fields are a versatile and efficient fine-tuning actuator to control the helium exhaust from a magnetically confined plasma. Helium will be produced in future fusion reactors as ash of the fusion process and needs to be exhausted efficiently to maintain a burning plasma. In the paper it is shown that for the two leading configurations, i.e. a tokamak and stellarator plasma, helium exhaust can be controlled and substantially enhanced by these fine scale external magnetic fields. The study has motivated recent follow up experiments at the U.S. National Fusion facility DIII-D, in which such small scale magnetic fields are used for control of the plasma edge stability. The findings discussed in the paper suggest that enhanced helium exhaust is another beneficial aspect of these additional magnetic fields – a very important finding also for ITER, the next step fusion experiment presently under construction in southern France. This work was funded by the U.S. Department of Energy under Early Career Grant DE-SC00013911. The paper on “Exploration of magnetic perturbation effects on advanced divertor configurations in NSTX-U” by Dr. H. Frerichs was added to the selection list of Physics of Plasma for 2016. The paper presents a first time systematic exploration of divertor conditions in the various advanced divertor configurations accessible at NSTX-U including the effects of resonant magnetic perturbation fields. This work was funded by the Department of Energy under funding DE-SC0012315. A review paper on detachment modeling with EMC3-EIRENE was published – IoP journal Plasma physics and Controlled Fusion. Department of Energy under grants DE-SC0012315 and DE-SC001391 (ECA). Also, we congratulate Heinke to his promotion to an Associate Scientist. Systematic numerical study of helical SOL transport and limiter fluxes for Wendelstein 7-X using the EMC3-EIRENE code was published by PhD student Florian Effenberg in IoP journal Nuclear Fusion. This paper describes a systematic numerical survey of basic scrape-off layer physics features in the startup plasmas of Wendelstein 7-X. The magnetic structure is analyzed and connected to the transport and limiter heat and particle flux features. 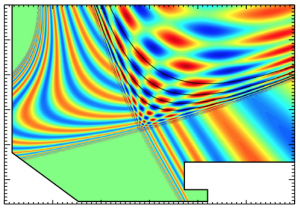 Radiative edge cooling is explored in this simplified geometry as a preparation for studies with the island diverter in the next experimental campaign. Strong presence of group members and affiliated group members on this years APS-DPP meeting in San Jose, California. 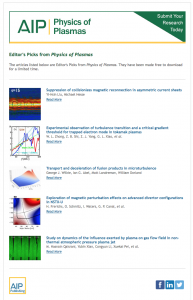 Paper by Heinke Frerichs on 3-D edge modeling for Advanced Divertors at NSTX-Upgrade selected as Editor’s Pick in Physics of Plasmas. The paper recently published in Physics of Plasmas by Dr. H. Frerichs discussing a survey of results on the effect of RMP fields on advanced divertor configurations at NSTX-Upgrade was selected as Editor’s Pick. Congratulations, Heinke! In this paper, the EMC3-EIRENE code was used to explore basic divertor characteristics for the major advanced divertor configurations achievable at NSTX-U. The results highlighted the general geometrical benefits of the various divertor configurations. Moreover, the impact of RMP fields on the divertor conditions and the target fluxes was analyzed. This work was funded by the Department of Energy under grant DE-SC00012315. 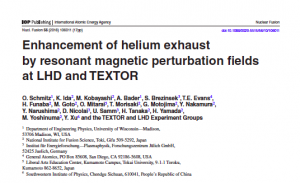 Paper on Enhancement of Helium Exhaust using Resonant Magnetic Perturbations was published. A paper was published in Nuclear Fusion today by Prof. O. Schmitz demonstrating on two devices that resonant magnetic perturbation (RMP) fields can be used to enhance the exhaust of helium from fusion plasmas. Sufficient helium exhaust is a mandate for fusion reactors as the helium produced by the fusion reaction of deuterium and tritium needs to be exhausted from the plasma to avoid that fuel (D and T) is replaced by helium which does not fuse under the condition of a man build fusion reactor. A small level of helium in the plasma mix can be tolerated but the effective confinement time of helium must not exceed the energy confinement time by more then some factors. Experiments proposed and conducted by Prof. O. Schmitz in collaboration with the local experimental teams at the limiter tokamak TEXTOR in Juelich, Germany and at the Large Helical Device LHD in Toki, Japan featuring the closed helical divertor have shown in a concerted approach that RMP fields substantially reduce this effective helium confinement time in the system. It was seen that the application of RMP fields yields increased retention of the helium which is recycled at the material interface. As the pumping efficiency for helium is small, this is an important mechanism to avoid the helium penetrating the plasma core domain again where the fusion processes happen. The plasma core at LHD was decontaminated substantially by the application of RMP fields with a drop of the helium content from 70% to 20% in the ion root confinement regime which is prone to impurity accumulation. This demonstrates that RMP fields can be used effectively to aid impurity exhaust even in unfavorable impurity transport regimes in heliotron type stellarator devices. 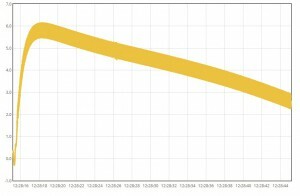 The figure below shows the effective helium confinement time measured at TEXTOR (left side) and at LHD ( right side). In both plots the effective confinement time is shown compared to the reference result without RMP field applied. A reduction of the global helium confinement of up to 50% at TEXTOR and up to 30% at LHD was shown. This work was supported by JSPS KAKENHI Grant Numbers 25420893, by start up funds of the Department of Engineering Physics and of the College of Engineering at the University of Wisconsin—Madison, USA and under grant DE-SC00013911 and DE-SC0006103 of the U.S. Department of Energy. 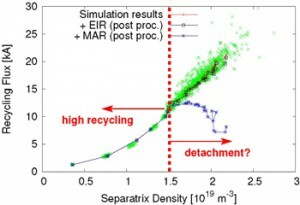 Paper on 3-D edge modeling for Advanced Divertors at NSTX-Upgrade was published. 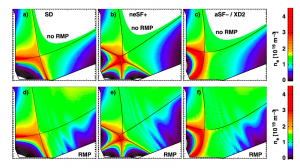 A paper was published in Physics of Plasmas today by Dr. H. Frerichs discussing a survey of results on the effect of RMP fields on advanced divertor configurations at NSTX-Upgrade. The EMC3-EIRENE code was used to explore basic divertor characteristics for the major advanced divertor configurations achievable at NSTX-U. The inherent flexibility of the modeling grid of EMC3-EIRENE enables such targeted studies on feasible time scales. The results highlighted the general geometrical benefits of the various divertor configurations. 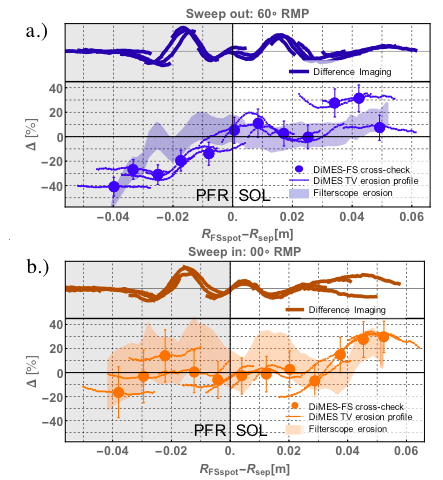 Moreover, the impact of RMP fields on the divertor conditions and the target fluxes was analyzed. This work was funded by the Department of Energy under grant DE-SC00012315. The systematic survey study is the basis for detailed analysis of neutral fueling and exhaust and in how far the divertor topology and the application of RMP fields impacts on these critical root mechanisms for density control at NSTX-U. This is the goal of the PhD project of Ian Waters and Kurt Flesh which will address this question in a concerted approach with EMC3-EIRENE as feasible, state of the art tool and dedicated diagnostic activities. Paper on 3-D edge modeling for ELM control at ITER published in IoP Journal Nuclear Fusion. 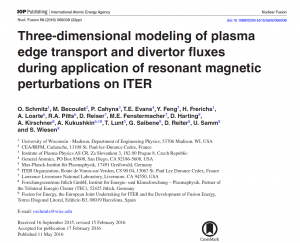 A paper was published presenting a thorough assessment of the impact resonant magnetic perturbation fields have on plasma edge transport and the divertor fluxes. This assessment utilizing the EMC3-EIRENE code is a result of a multi-year study within an international team and is presently being used as a baseline study in discussions of the advising bodies at ITER. Comparisons to experimental results from various RMP tokamaks is ongoing within the recently founded ITPA Divertor and Scrape-off layer activity on “Effect of 3-D fields on divertor conditions and plasma wall interaction as compatibility issue of RMP ELM control” (ITPA DSOL task 37). The paper appeared today in Nuclear Fusion. This work was funded in part by the DoE Early Career Award and by Startup funds of the Department of Engineering Physics at the university of Wisconsin – Madison..
Florian Effenberg wins one of the Student Poster Awards on the 2016 Sherwood Theory Conference! Florian received this award for his poster on “3-D Modeling of Edge Transport and Plasma Surface Interactions for Wendelstein 7-X Startup Plasmas”. Congratulations to Florian! This work was funded by the Department of Energy under Grant DE-SC0014210. 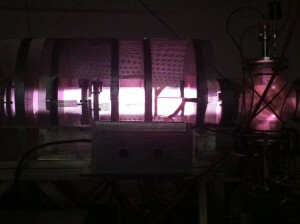 Stable plasma conditions in the MARIA helicon device! Here are some exciting news about our helicon device MARIA which is used to explore stable access to laboratory scale high density plasmas. As always, “high” is relative, but we target on densities which are representative for possible next generation wake-field accelerators (high 10^20 per cubic meter) and also for divertor plasma conditions in fusion devices. A critical question for helicons is how this particular RF wave localized just below the lower-hybrid cut-off frequency is so effective ionizing a neutral gas and that above an empirical limit further fueling the dense plasma column seems very difficult as a depletion of the neutral population occurs. Our endeavor to shed light into this question is funded by the National Science Foundation (NSF) under the CAREER award. The device is used also as a facility in the research on 3-D Plasma Wall Interactions funded by the Department of Energy under the Early Career Award program. In the past year, the two graduate students Jonathan Green and Victoria Winters managed to establish a reliably working facility in which a stable helicon plasma is obtained regularly. This plasma was now characterized for the first time in detail and it was shown that with just 750 W of RF power, a plasma of 2.3 eV electron temperature, 0.1 eV Ion Temperature and 1.2 x 10^18 per cubic meter plasma density was obtained for time scales of 20 minutes. This is an excellent basis for further developing the plasma to the density regime in which neutral depletion occurs by enhancing the RF power. Power supplies to go up to 15kW are available and are being prepared for implementation together with a second antenna. Also, the setup of a sophisticated LIF dye laser system is ongoing to characterize the ionization process by active laser spectroscopy. This system will be used in addition for direct validation of collisional radiative models developed for application in the island divertor at Wendelstein 7-X. in collaboration with Prof. Stuart Loch, Auburn University and Dr. Jorge Munoz-Burgos from the Johns-Hopkins University. 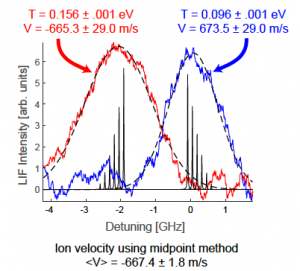 The existing LIF setup based on a diode laser has been used to explore a new method to measure the ion velocity. The symmetry of the anomalous Zeemen effect is being used to avoid the detailed de-convulution of the measured LIF spectrum. The demonstration of this technique is being presented as a poster by Jonathan Green this week on the 19th International Conference on Atomics Processes in Plasmas, Paris, France. This research activity is carried out in a close collaboration with Prof. Noah Hershkowitz, Emeritus Professor in our department, Prof. Greg Severn, Chair of the Department of Physics at the University of San Diego and with Dr. Umair Siddiqui, Post-Doctoral researcher at the West Virginia University. Links to the MPEX team at the Oak Ridge National Laboratory (ORNL) and the group of T. Klinger/O. Grulke at IPP Greifswald operating larger scale, high power density facilities are being established. First plasma in Wendelstein 7-X and first measurements for us! The first official plasma has been obtained in Wendelstein 7-X today at 2015-12-10T12:28:15.182965421Z in the official W7-X time base. We participated remotely in the inauguration ceremony and could feel the excitement of all people involved on this truly historic step in fusion sciences. Congratulations to the entire Wendelstein 7-X team on this monumental step. We participate on the device with several diagnostic projects and a numerical study on plasma edge transport. The diagnostics which the graduate students L. Stephey and T. Kremeyer prepared in the past year and intensively during long term research visits this summer took data during the first plasma. Below a plot of the neutral pressure in the plasma periphery measured with the UW Madison Penning gauge at W7-X is shown. This is a collaborative project with IPP Greifswald and Dr. Uwe Wenzel was visiting this week for detailed discussionson the next steps in the project and also for a visit to our vacuum laboratory in which we prepare this diagnostic component for W7-X. RA T. Kremeyer is responsible for this project and he will conduct his PhD research on neutral gas dynamics and plasma fueling at W7-X. This work is funded by the Department of Energy under grant DE-SC0014210. RA L. Stephey from the HSX Laboratory in the Department for Electrical and Computer Engineering works under this grant to measure limiter heat and particle fluxes at W7-X and establish a single reservoir particle balance. A first image from the first plasma at W7-X taken with a CCD camera with a filter which L. Stephey initialized and activated for measurements is shown below. It shows the plasma column in front of the limiter at the inner side of the vacuum vessel. This activity is a close collaboration with Dr. G. Wurden from the Los Alamos National Laboratory. L. Stephey is also responsible for on-site maintenance and operation of an Oak Ridge Filter Scope system. Both systems and supplemental general diagnostics will be the basis to assess the W7-X particle balance and make direct comparisons to HSX. We are excited to be part of the U.S. team working on W7-X and look forward to fruitful and exciting physics studies on this unique device. Two papers published in the present volume of Physics of Plasmas! One paper deals with the helical modulation of the electrostatic potential around edge magnetic islands in tokamaks and the similarity to ion and electron root transport in stellarators. This paper is the result of a collaborative study with Drs. G. Spizzo and G. Ciaccio from the Reversed Field Pinch experiment RFX in Padua, Italy and uses a Hamiltonian drift orbit code ORBIT developed by R. White from Princeton Plasma Physics Laboratory. This work was funded in part under the Early Career Award from the Department of Energy grant DE-SC0013911. a detailed study of the interaction with fractal stochastic field structures due to perturbed fixed points in tokamak plasmas and the occurrence of counter streaming 3-D flow pattern. This paper is based on plasma configurations as obtained at the DIII-D U.S. National Fusion facility in San Diego, CA. This work was funded in part under the Early Career Award from the Department of Energy grant DE-SC0013911. Wendelstein 7-X stellarator is ready for operation! The Wendelstein 7-X stellarator designed, constructed and soon to be operated by the Max-Plank-Institute for Plasma Physics in Greifswald Germany is ready for operation. In the past couple of weeks the superconducting magnetic coils system of this first of its kind quasi-isodynamic optimized stellarator have been commissioned. Last week, mapping of the magnetic field structure with electron path of flight emission has shown that good magnetic flux surfaces are generated. Characteristic resonant surfaces in the magnetic structure have been identified and initial comparison to field line modeling has shown a good agreement with the predicted location of the flux surfaces. See recent press release for more information (http://www.ipp.mpg.de/3897638/07_15). The device is now ready for operation and awaiting the operation license from the state government in Meckelnburg-Vorpommern. Congratulations to the entire W7-X team for this success. We are looking forward to work on this world-class facility. We are involved within the IPP-U.S. collaboration and contribute with experimental and numerical analysis of plasma edge transport and neutral/impurity household in the edge plasma to the program. Below is a figure from EMC3-EIRENE modeling (courtesy of Florian Effenberg, 3rd year grad student) showing the radiation distribution of double ionized carbon in the helical scrape-off layer during the limiter startup phase. This work is funded by the Department of Energy under grant DE-SC0013911. We received two more grants from the Department of Energy (DoE)! NSF funds our work on“Understanding of neutral particle physics to generate a helicon wave driven high density laboratory plasma” as NSF-CAREER award. is among the 2014 Highlights in the IoP journal Nuclear Fusion. 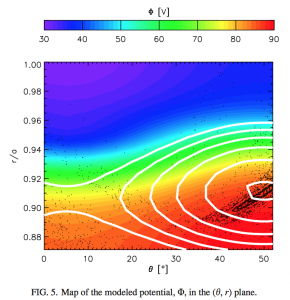 2015-01-10 —Paper by Heinke Frerichs under 2014 Editor’s pick of Physics of Plasmas. 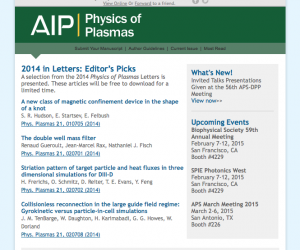 The paper “Striation pattern of target and heat fluxes in three-dimensional simulations for DIII-D” is among the papers presented as Editor’s pick for 2014 in the AIP journal Physics of Plasmas. Congratulations Heinke! 2014-08-22 — Good News: First plasma was launched at MARIA. On September 16, 2014 the first plasma was launched in the renovated Magnetized AnisotRopic Ion-distribution Apparatus (MARIA). Victoria Winters, the graduate student working on the device accomplished this important step together with Umiar Siddiqui, a former PhD student of Prof. Hershkowitz who has setup the device. The device will be a multi-purpose high density, low temperature plasma test facility. We will address atomic physics as well as plasma material interaction issues on the setup. It is planned to enhance the device for high density operation at detached divertor temperature conditions which requires enhancing the helicon wave power, coupling ion cyclotron heating and also improving the neutral fueling capacity. 2014-08-22 — Good news: The first grant was awarded by the Department of Energy to our research group for work at NSTX-Upgrade! Title: Control of Neutral Fueling and Helium Exhaust in NSTX-Upgrade Plasmas by Three-Dimensional Magnetic Control Fields. DoE Grant number DE-SC0012315.